2) Esfinge, Fuego, Stigma b Cancerbero, Raziel, Universo 2000 Jr.
Stuka won with torpedo splash in 6:36. 6) Juice Robinson, Marco Corleone, Matt Taven b Diamante Azul, Valiente, Volador Jr.
Volador told the press that Mexico team would be more united than the World on 09/01. The show was said to be fine, with nothing great but building things on. Probably that’s the way of things until 09/01. Sugehit and Zeuxis both made a point of saying they want to get the women’s matches in the semimain events and main events after their performance in the 09/16 mask match. No lineup for next week yet. I have quick results for Super Astros from The Gladiatores’ Facebook, but probably more details over the weekend. The big story might be that the power went out in Arena Naucalpan right before the show, but it did come back later on. A few more things, mostly from the press conference and the press release about it. Copa TripleMania is now Torneo TripleMania XXV, since they’ve got a belt and not a trophy or cup. They talked a lot about how the belt they’re giving out took 45 days to construct. They did not talk a lot about how the torneo is going to work or how a trios tournament ends up with one winner. It is a trios tournament, which is evident if you look for it but not specifically stated. The last two teams may not be right; by the way the field’s been listed, it should be Pirata Morgan & Heavy Metal with the TBA and Metal on the other team, but the press reports say Demon’s got the unannounced partner. The other thing is the 14 names announced for La Llave a La Gloria are not the winners, but finalists. The actual winner(s) will be announced at TripleMania (maybe after a game of duck duck goose?? ), which explains why there’s so many people left. There’s nothing said about the iPPV. Dorian did say they’ve sold 90% of tickets, and those two items are probably related. They’re not going to announce any deal that would allow people to see the show cheaper than the tickets or free on Twitch until there are no tickets are to be sold or until it’s just going to be the people who walk up to buy it anyway. If AAA sells out in the next few days, then maybe we’ll get an announcement early, but that’s unlikely. Plan on nothing being announced for TripleMania’s internet plans until Friday, the day before the show, but plan on it actually happening. There’s no sense there’s English commentary this time around and they really might as well not spend the money if it’s going to be on the level of Striker the last two years. Psycho Clown talks about the mask match. He notes the Match of the Decade billing puts a lot of pressure on them. Arena Coliseo has more Mexico vs The World and a Rey Cometa/Virus match. More Mexico vs The World in Arena Mexico. 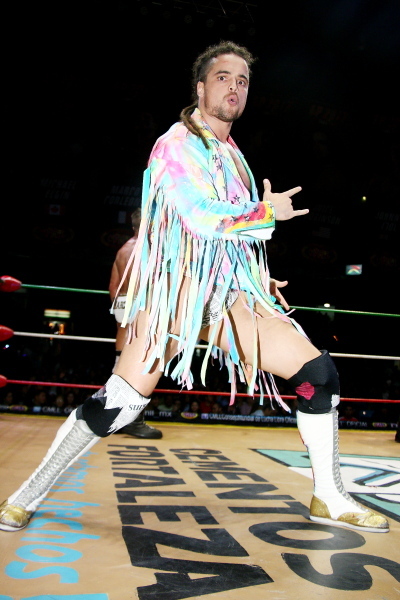 Zeuxis and Amapola head to Guatemala for a singles match. The Crash is debuting in Nuevo Laredo on 10/09. Rey Mysterio’s promo for the title match on Lucha Underground. Lucha Underground is starting in India soon on DSport, probably with Season 1. DSport appears to be a new (and probably small) station. Kcidis draws Gran Guerrero vs Niebla Roja and brother’s masks. There will be another Leyendas Inmortales show on 09/17 in Guadalajara. On Edge & Christian’s podcast, Bryan Danielson revealed he hated Sam Adonis – because Adonis got to beat Blue Panther for his hair, the match Danielson wanted. The Tampico Disturbio promotes his upcoming 12th Anniversary show. Cordoba luchador Ringo Acosta says he’s going to retire soon. The latest Fuego en el Ring has Aeroboy as a guest. Kushida/Titan was said to be the match of the night. 08/19 is ongoing as a type this, with Ultimo Guerrero & Rey Bucanero beating Mistico & Titan early on the show. Someone from CMLL has to be getting a win on Sunday to even things out; probably UG & Rey Bucanero over the Bricoes the way they’re being used.